Get ready to meet your new favorite pizza! Sometimes you need to walk off the beaten path to end up with delicious creations! Of course we all know and love our pizza with tasty tomato sauce and lots of mozzarella cheese – it’s delicious, but might get a bit boring at times. This little recipe turns your pizza into something spectacular and unexpected! Deliciously browned sausage with a hint of mustard on a bed of sticky and caramelized onions, accompanied by small patches of fresh spinach and puddles of gooey cheese. I know your mouth is starting to water while you are reading this! Time to get creative with your pizza! 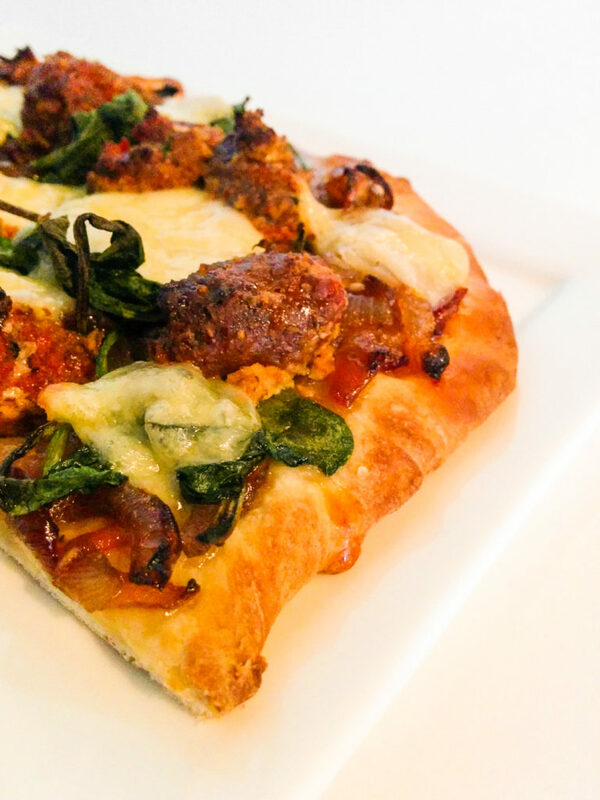 Delicious pizza with sausage, mustard, spinach and of course lots of caramelized onions! Prepare the pizza dough according to the instructions and let it rise. While the dough rises, slice your onions. Put a big skillet with high rim on medium high heat. Add olive oil, sliced onion, needles from the rosemary twig as well as the salt. Give a good stir and simmer 30 minutes until onions are browned and caramelized. Stir every now and then. If the onions get too brown add a splash of water to prevent them from burning. Add the sugar, season with ground black pepper and stir in the balsamic vinegar. Let the onions cook till the vinegar is fully evaporated. The onions should be brown and sticky by now. Squeeze sausage meat out of the skins and carefully combine them with the mustard. Put the spinach leaves in a colander and pour over boiling water. The spinach will wilt. Let cool for 3 minutes and then squeeze out all moisture. Do this thoroughly or your pizza will get soggy! Line a baking tray with parchment paper, transfer the dough onto it and stretch in shape. Put the sticky onions onto the pizza dough and spread out evenly. Add little piles of drained spinach and the mustard flavored sausage pieces. Place cheese cubes on the pizza and bake in the oven for about 15-20 minutes until nicely browned. Slice up your delicious sticky flavorful pizza and dig in! Did you ever try pizza like this without tomato sauce before? What kind of sausage do you think works best on this pizza? Let us know in the comments below and help to make this recipe even better!